Various dates and locations throughout 2014. Good clean fun! 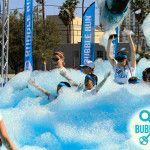 Check out a Bubble Run in a city near you. This 5K fun run is a blast with 6 foot Foam Bogs every kilometer that will leave you covered with a rainbow of colored foam. They also have Bubble-teers (volunteers + bubbles…get it?!) that are ready to shoot foam cannons at you just to make sure that you’re completely doused in foam. Of course, there’s a post-race party with cool music and dancing and more bubbles!